A beverage pairing will also be available for an additional $25 per person. A limited a la carte lunch menu will also be available from 11 a.m. to 3 p.m.; in fact, Tongue & Cheek will be open for lunch, with a la carte service only, on Wednesday, February 19 and Thursday, February 20. Reservations are highly suggested and can be made in advance by calling (305) 704-2900. With more than 25 years in the culinary profession, there aren’t many places Chef Robert Irvine hasn’t cooked or challenges he hasn’t had to cook his way out of. During his time in the British Royal Navy and in the years that followed, Robert has cooked his way through Europe, the Far East, the Caribbean and the Americas, in hotels, on the high seas and even for the Academy Awards; and that was before his career in TV. As the host of one of the Food Network’s highest rated shows, Restaurant: Impossible, Robert is best known for saving struggling restaurants across America by assessing and overhauling the restaurant’s weakest spots. Recently, Robert added a new challenge to his resume as he mentored and challenged aspiring chefs as the host of Food Network’s new show, Restaurant Express. Going on its third year, Robert continues to tour his live show, Robert Irvine LIVE, across the US. 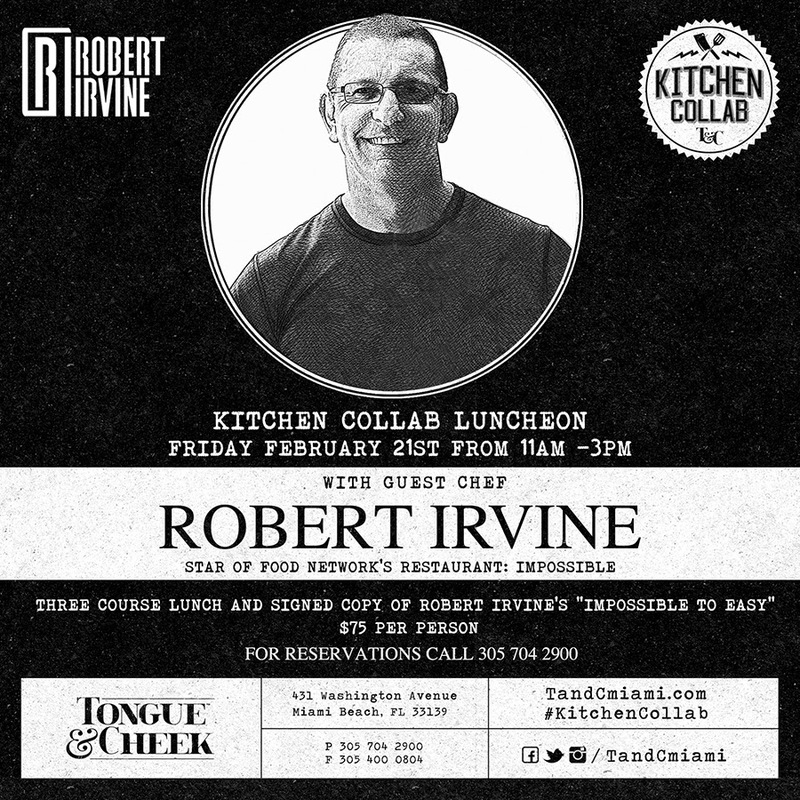 Robert also operates Robert Irvine’s Nosh, a restaurant in Hilton Head South Carolina, and is the author of two cookbooks, Mission: Cook! and Impossible to Easy. Robert was previously the host of Food Network’s Dinner: Impossible and Worst Cooks in America.